Here’s another great community tool, that could be classed as using the digitl world and making it analog again. 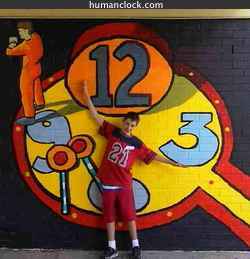 The tool is called Human Clock and like this picture shows the current time with a range of pictures which are a refreshing change from the ordinary digital numbers. Perspective: A simple idea, that is founded on tapping social networks to deliver the clock pictures, and despite Google Ads on the site, there is an absence of advertised products in the human clock images. So come on brands, could someone create a version called Product Clock.com showing clocks made out of Mars Bars, Beer Cans, or even Boxes of flour?